EBL Construction, a division of EBL Partners, an established construction and project management firm based in Naples, garnered two Sand Dollars Awards during the annual Sand Dollar Awards gala presented by the Collier Building Industry Association (CBIA) Sales and Marketing Council on Saturday, Sept. 27, at the Ritz Carlton Tiburon, in Naples. The Sand Dollar Awards are the highest accolades given by the CBIA and are presented each year to member builders, developers, architects, remodelers, interior design firms, landscape architects, trades, marketing, sales and advertising professionals who have demonstrated building, design and marketing excellence. 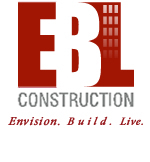 In the Out of Market, Best Remodeling Project of the Year category, EBL won for Canyon Ranch N405, a luxury condominium residence in Miami, Florida. The goal with this home was to renovate an existing, outdated space and deliver the ultimate leasable condominium residence. This three-bedroom, three-and-one-half bath oceanfront home offers sweeping views of the water, large open spaces and soaring ceilings. The design reflects the tall ceilings, natural light and expansive views. The entry to the residence evokes a gallery-like feel with its marble floors, framed interior partitions and long hallway leading to the integrated living-dining room. The dramatic feature wall lining the dining room is composed of stone, which adds texture and provides a perfect complement to the space. The area’s large, two-story windows add a dramatic touch. In the open kitchen, the cabinetry’s custom wire mercury finish plays perfectly against stainless steel appliances. Recessed lighting and antique brown granite countertops contrast and complete the kitchen’s sleek, modern appearance. A wood staircase leads upstairs to a luxurious master suite featuring a sleek dressing room, Majorca split-face limestone, freestanding tub and gorgeous bedroom with doors opening to a balcony. A second-floor loft functions as a second living room and offers stunning views. EBL was also a winner in the Out of Market, Best Community Feature of the Year category for the Ranch Club Pool Pavilion at Boot Ranch, in Texas. The Ranch Club Pool Pavilion is a showpiece of the community and ideal for rest, relaxation and recreation. The expansive complex includes four heated pools – for family, activity, children and adults only – and a spa. An open-air pavilion seats up to 300 and features flat screen televisions and ceiling fans. Tables and lounging options abound for social gatherings and more private seating is located near the adult-only pool. An event arbor offers a picturesque backdrop for special occasions, while well-appointed men’s and women’s changing facilities feature lockers, restrooms and outdoor showers. A Ranch Club Grill features a wood burning pizza oven, kitchen and bar facilities for guests dining enjoyment. The pool area is the picture of rustic elegance, with the generous use of flagstone pavers throughout the space, including walkways and river rock stone. American Clay Plaster was used in the interiors of the building. The product was applied to all exposed walls and ceilings, providing and aesthetically pleasing, finished product. Existing natural materials were used to build seating and create custom bridges.